Year three and four at Grove road community primary school had the pleasure of watching 6 eggs incubate in their class room. A chart marked the twenty one days it took for the chicks to hatch and each child waited in anticipation of the new arrivals. On day twenty the first chink appeared in the first shell and by the end of the day ‘Peppa’ chick was born. ‘Katy Perry’ chick arrived soon after and over the next few days two more chicks entered the world. The chicks will stay in the classroom for two weeks until eventually it is time for them to go to their new home at a local farm. 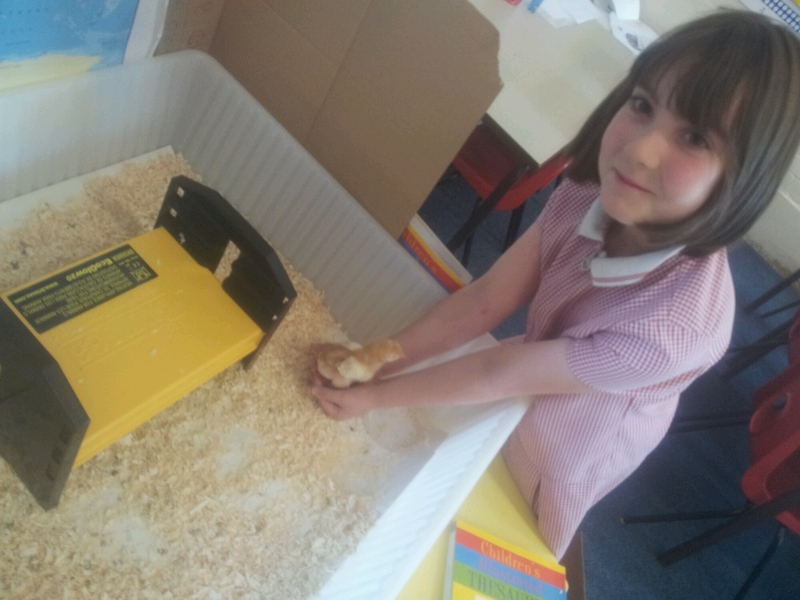 Being in the midst of a busy class room from day one has meant that the chicks are incredibly tame. Sophie brought Annie and I to see them today. I was amazed at how she only had to put her hand into the arena and the chicks came trotting over and climbed up onto her hand for a stroke and a cuddle. Sophie was so careful with the chick, who pottered about happily on her palm before trying a speculative,’is this food?’peck at her fingers. I think class three and four are going to really miss their yellow fluffy visitors when they depart for pastures fresh.